A “Volkswalk” is a noncompetitive 10-kilometer walk. Recently, the American Volksport Association, has ranked the trails at Spring Mill State Park as the 9th best in the nation. Fortunately, a friend of mine who is hosting me here in Bloomington IN is kind enough to point this out to me in a local news article he shows me. As the state park is 30 minutes south of his condo, it is a no-brainer that I need to confirm this ranking. A new friend in town agrees to join me. We couldn’t have picked a better day – weatherwise – to hike. The weatherman assures us we will have a spectacular November Sunday. Sparklingly bright, sunny, crisp fall day. Temperatures reaching 75 degrees. I purchase a cranberry turkey sandwich and a chicken wrap at the Bloomington Scholars Inn Bakehouse for the hike nourishment. And on a Sunday following a Indiana University home football game, that means I wait in a very long, crowded, boisterous line for almost 30 minutes to order. Spring Hill State Park contains an enormous water-powered grist mill. The Park also contains a Karst limestone topography. Over the course of geologic time, huge caves have formed in the limestone as a result of the decomposing vegetation creating weak acids that slowly dissolve the limestone. 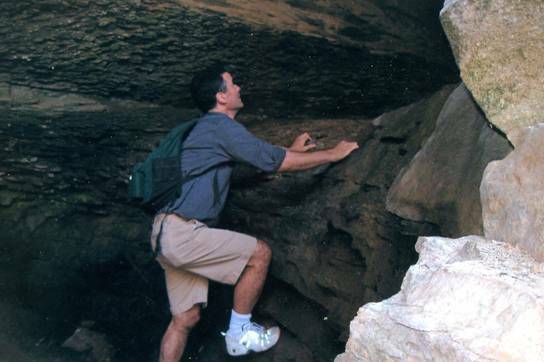 The first cave we come upon is Donaldson Cave. An interpretive sign tells us that the (endangered) northern blind cave fish have been found in the cave. The fish are born and live their entire lives blind, as the dark environment they live in lives makes sight unnecessary from an evolutionary point of view. A long wood stairway leads hikers down to a small, rocky stream flowing through the forest. We hike upstream and come upon the huge, imposing Donaldson Cave entrance. Quickly, I scramble up a small rock wall to gain entrance. Inside, I quickly find I’m blind (like the fish) without a flashlight. But I eventually come to a bend in the relatively large, damp tunnel. Looking down around the bend, there is a long, illuminated corridor in front of me. “Wow. This is amazing,” I mutter under my breath. The corridor and room are surprisingly large. As we leave, I lift myself up a rock face just outside the main entrance, where I am able to crawl back inside the cave and peek at this corridor from a small portal. 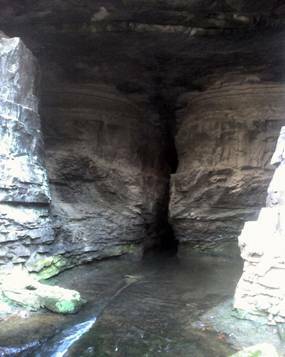 Further along on “Trail #3”, we arrive at Bronson Cave, which does not allow public access, but nevertheless is a worthwhile site to visit. In November, the forest is nakedly without leaves, which provides us with a relatively stark (instead of lush) ambience. The trails are thick with fallen leaves at this time of year, and undulate up and down in the depressions and hills of the Karst terrain. Trails in the park are mostly poorly marked. After one passes the ranger station at the south entrance, the visitor sees no signs pointing out the location of or direction to trails until reaching the northern extreme near Spring Mill Inn. This despite the fact that the park entrance road crosses a number of trail crossings as it you drive north. In addition, when trails cross parking areas, there are often no signs directing hikers to where the trail starts up again. Similarly, when there is a trail intersection or fork, there are often no signs informing the hiker which trail is which. We also had some difficulty with the lack of trail blazes – particularly with a trail that, at this time of year, is hidden under a thick layer of leaves. The lack of signage was not a significant problem, however, as it simply means that the hiker needs to rely more on the trail map brochure provided at the park. While the trails at the park are generally pleasant, we never experience a sense of “remoteness” on them. A large percentage of trail distance, for example, is closely parallels park roads. “Civilization” always seems nearby. This “urban park” ambience is probably due, in part, to the relatively small size of the park (the park is 1,319 acres in size). Curiously, even with perfect Sunday weather on a very pleasant trail system, we find almost no other hikers on the trail. Overall, Spring Mill State Park offers a pleasant, memorable hike worthy of a visit.